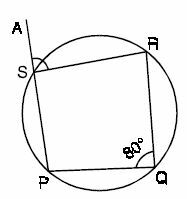 Q 1: Find angle ASR. Q 3: You are selected from your school to participate in chess a game being conducted in another school. You cycled to reach that school as follows: From your house you cycled 8 km to the north and then 5 km to east and then 4 km to the north. How many km did you peddle to reach the other school ? 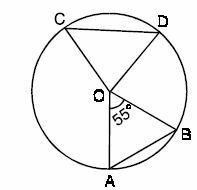 Q 4: AB and CD are two equal chords, if ang AOB = 55o, find ang COD.